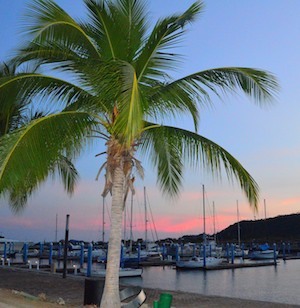 Marina Chahué in Huatulco - Communing with the parrots! Mid-November, 2012 – The great thing about this beautiful little cruising ground among the Bays of Huatulco is that when it gets gnarly out in the bays, you can run for cover in the shelter of the marina. We left Tangolunda Bay after two days of swinging back and forth like a church bell gone wild, and instantly relaxed as the boat steadied and then went into a wonderful, motionless torpor in the marina. We were treated to lovely afternoon sunsets that lit the sky in shades of gold and pink and orange, and we walked and walked and walked, thrilled to be back on terra firma. We had been loving swimming off the back of the boat, but the newfound pleasure of stepping off the boat onto dry land was equally thrilling. Unfortunately, Huatulco’s Marina Chahué (pronounce Cha-WAY) is a poorly appointed little marina that is hopelessly overpriced. Run by the government, our jaws dropped when we were told the fee would $30 USD a night without hookups to electricity and water!! (those luxuries would have been $5 more). 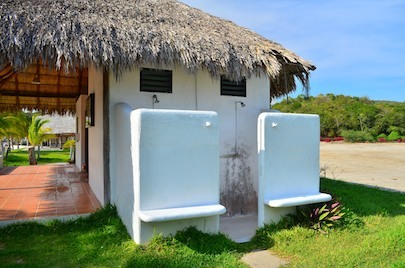 Cold water outdoor showers – without privacy!! The one amenity on offer for visiting boaters is a cold water outdoor shower that doesn’t even have a curtain or door! Needless to say, there is never a line for the shower!! By comparison, for the same price, Paradise Village Marina, a resort marina in Puerto Vallarta, offers swimming pools, hot tubs (including a an indoor candle-lit hot tub for the gals), a spa, a beautifully appointed gym with all the latest equipment, a pretty and meticulously groomed beach that goes for miles, and walking access to all the restaurants and boutiques a tourist could ever hope for. It is no wonder that Marina Chahué is nearly vacant while Paradise Village has lots of boats, especially given the hundreds of miles and several overnights at sea required to get here. What could be a fabulous cruising destination is just a brief stopover point for the handful of boats that pass through. One such transient boat pulled in during our stay. The neat thing about megayachts is that you can often look them up online and get a tantalizing peek at what lurks behind the tinted windows. This one, “Legacy,” is 164′ long and is listed on Charter World as having been launched in December, 2011. It’s basically brand new! The photos of the interior are lovely, but we had to satisfy ourselves with taking photos of the outside and dreaming. Other than seeing the scurrying hands while the boat was docking, we never saw a soul on deck! 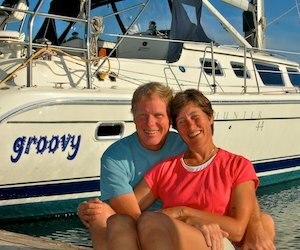 After an exciting cruise south, Colleen and Marc’s boat is ready to take visitors daysailing in Chiapas. 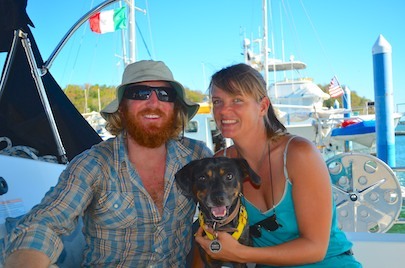 What fun it was to meet them and their dog Torch as they got ready to pile into their pickup-conversion-camper and drive home to Texas after an adventurous cruise down the Mexican coast. 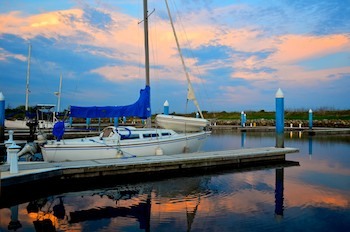 It is common for retirees to set sail on a boat after years of dreaming and planning. 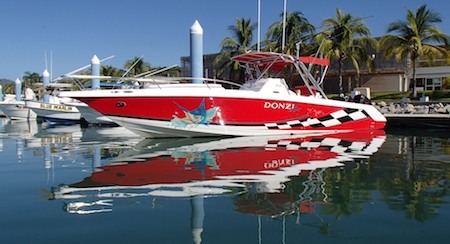 Their boats are solid and decked out in the latest gear to make living aboard as comfortable and as safe as possible. Their boats are ready for all that the sea might dish out. Old folks have the money and the time to do these things, and 95% of cruisers in Pacific Mexico are over 50. How refreshing and inspiring it is, then, to meet a couple in their twenties who threw caution to the wind, bought a small 1970’s vintage boat, and took off down the scary coast, latest fancy gear be damned. The boat sailed well, what more could you want? Now, with one big cruise in their back pockets, they are off to make a little money in Texas and then do it all again — in the Caribbean. 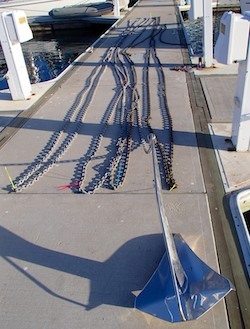 The anchor chain is laid out on the dock. The more frequently used end near the anchor is rusted. Old or new, big or small, if you want your boat to be a chick magnet — or at least to look its best — you gotta work at it. 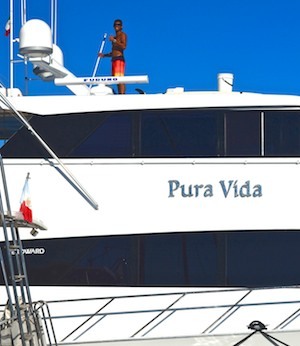 When the 100 footer Pura Vida pulled in, within moments of tying up, the crew went to work cleaning, polishing and waxing. At least a few hours of work on a boat each day is just part of the boating life, whether you are paid crew or a grubby cruiser living the Life of Riley. Mark had a long list of things to do on the boat and we jumped right in. Most were mundane, like fixing a leak in the kayak (again! but darn, we love that little boat anyway…), and polishing away the various rust stains that had appeared on parts of the hull. But most interesting was swapping the anchor chain end-for-end. After 550 days of anchoring out, the link holding the anchor had been startlingly eaten away by rust, while the opposite end of the chain was still bright silver. 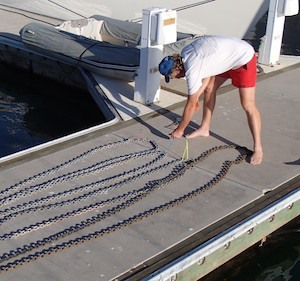 A few of the tie-wraps marking the distances had come off too, so Mark had a chance to put new ones on at 30′ intervals. That way he has some idea of how much chain he has let out in the water — the deeper the water (or more stormy the situation), the more chain you want to let out. 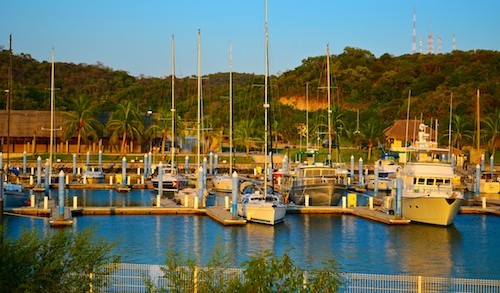 Marinas are always lively places that are full of action, even little-used ones like Marina Chahué. One afternoon a TV crew showed up at the mansion on the end of the point. We discovered the Mexican TV mass media company “Televisa” was doing a segment on Huatulco for a show that highlights cool spots around Mexico. Very conveniently, the local kids’ racing fleet had a small regatta that day, right out front. They zig-zagged back and forth as the TV cameras rolled. They were very cute. 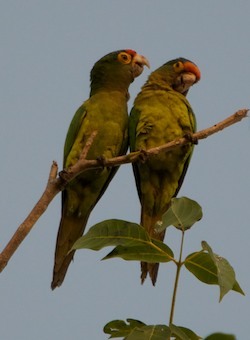 During our brief stay, Marina Chahué was loaded with birdlife. We were woken in the mornings with the calls of great kiskadees, which sound just like their name, “kis-ka-dee.” Grackles made themselves at home in our cockpit at times, squeaking at each other and peering at us to see just how much intrusion they could get away with before we shooed them off. 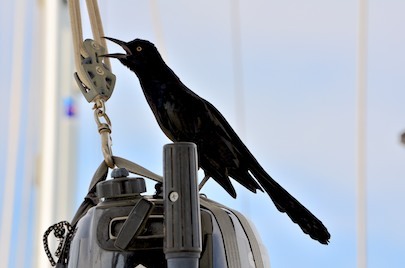 One morning Mark popped his head out the companionway and saw a row of birds sitting on the dock line of the boat next to us. There is quite a bit of surge in this marina, and the boats move around a lot. As the neighboring boat swung around in its slip, the dock line rose up and down. The birds didn’t seem to mind one bit as their perch soared and then fell. 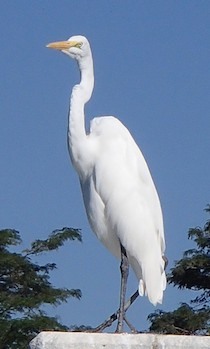 Taking the kayak out to explore the estuary in the back of the marina, we came across a rather stern looking great egret. He kept a close eye on us and our bright yellow boat as we drifted past him. But other than annoying him enough for him to lower one foot for a moment, just in case, he seemed okay with us coming quite close. The prize bird sighting came on land about a quarter mile from the marina, though. 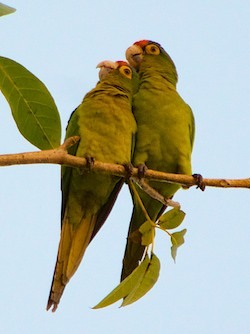 Just outside the busy supermarket, we heard the unmistakeable squeals of a flock of parrots. 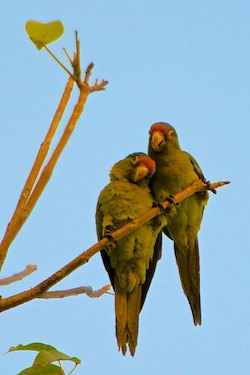 They were perched on every available branch of a tree, almost within arm’s reach. Unfortunately, the wide angle lens I’d brought with me couldn’t quite capture them… And why hadn’t I brought my telephoto lens to the supermarket?? I’m beginning to learn: take all the camera stuff everywhere! We hurried home, teased most of the way by this exuberant flock as it zoomed every which way in the sky, buzzing us repeatedly and landing in trees and chattering at us all along our route home. Why, oh, why didn’t I have that long lens? 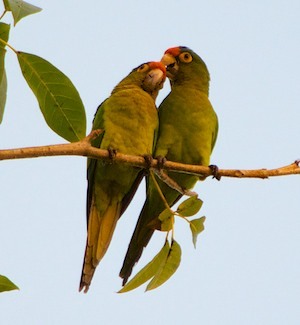 I looked them up online later and found out they were half-moon conures. We had planned to leave the marina the next morning, but Mark gave me a smirk when I said something about staying one more day — we both knew why. The next afternoon I ran over to the supermarket, this time with the long lens and fully charged battery, all ready to roll. I could hear the parrots in the distance. Suddenly, there they were, landing in the tree right above me at a hopelessly busy street corner. I snapped some shots. Wrong settings — all dark. I snapped some more — better, but blurry. Oh gosh, Don’t fly away!!! I kept thinking. Then I remembered the settings Mark had recommended as I leapt off the boat a few minutes ago, and I punched the buttons as the buses and taxis whipped around the corner at rush hour speeds. Camera finally set, the birds began to settle down too. 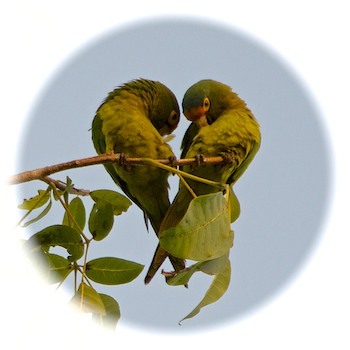 Little pairs sidled up to each other at the ends of each of the branches. They all flirted with each other shamelessly, clucking, preening, smooching and all. One pair just above me put on a wonderful show, nuzzling together like the happiest of lovers, all beneath a single heart shaped leaf. 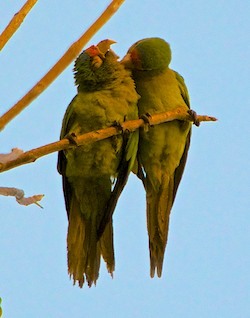 When they finally finished snuggling with each other and got down to serious preening, two birds were back-to-back. 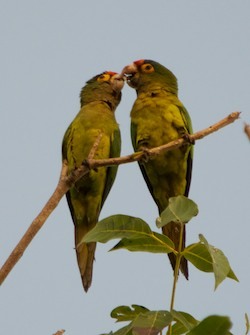 They craned their necks towards each other, forming a perfect heart shape. What a beautiful few moments. 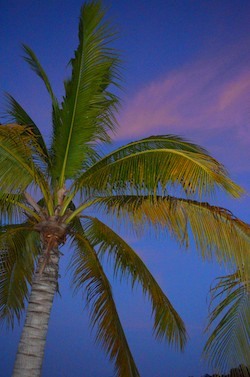 Eventually the parrot noises in the tree quieted down to a low murmur as the sun stole out of the sky. I left the birds to their romantic starlit night and wandered home to my own love, totally happy inside. The incredible charms of the Huatulco area continued to enchant us when we visited the tropical fruit and flower orchard of Hagia Sofia. This entry was posted in Mexico's Mainland Pacific Coast (South) and tagged Birds, Birds and Wildlife, Huatulco, Mexico, Mexico's Mainland Pacific Coast (South), New, Travel, WP Travel by Roads Less Traveled. Bookmark the permalink.